The Internet is loaded with a million different variations of the world’s best combination of flavors, and I’m here to add my version of low carb peanut butter cups to the collection! 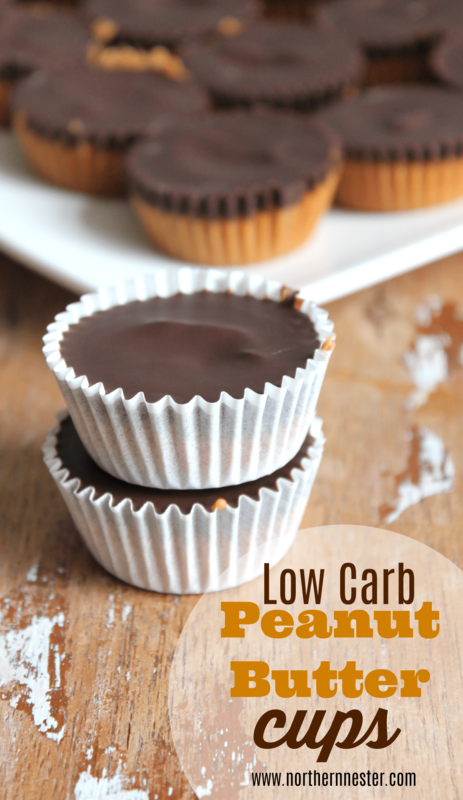 I’ve been tweaking this low carb peanut butter cup recipe for over a year, and now it’s exactly how I like ’em! Pre-THM, my favorite chocolate in the world was a Reese’s Peanut Butter cup. Even now, I cannot be trusted to leave them alone if they are in the house. I love the “snap” of the chocolate layer, followed by a perfectly textured peanut buttery filling. 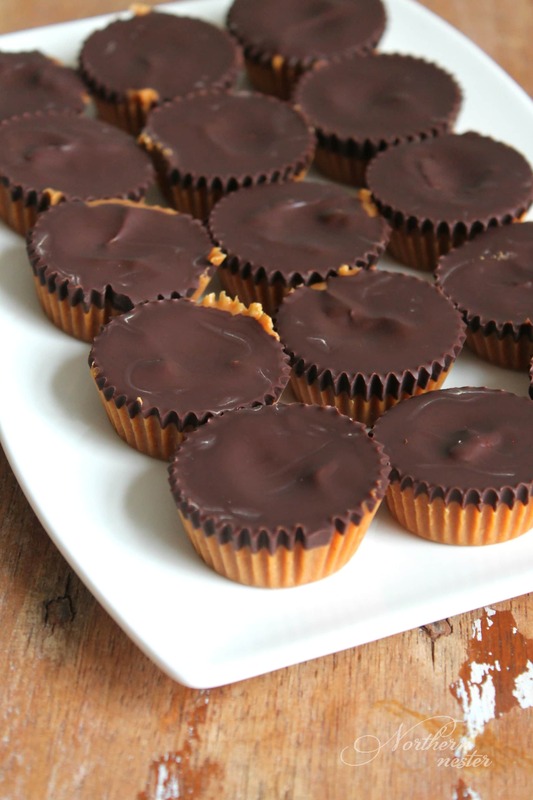 The ratio of chocolate to peanut butter in those cups is just right, too. My first goal with these low carb peanut butter cups was to recreate the same peanut butter texture you find in a Reese. It needed to be slightly chewy, but not too creamy or crumbly. First, I tried using just butter for the oil in the filling, but even though the flavor was amazing, it was too crumbly after it solidified in the fridge. I’m really not a big fan of the flavor of coconut oil, but I love its melt-in-your-mouth factor. I swapped out part of the butter for coconut oil and the result was perfect: enough butter to mask the coconut oil flavor, and enough coconut oil for the peanut butter cups to melt in your mouth (instead of crumble). A small amount of coconut flour, almond flour, and golden flaxseed meal mixed with a much larger amount of defatted peanut flour create an almost graham crumb texture inside the buttery filling. I’m all about quick and easy recipes with no special ingredients, so instead of making the chocolate layer of these low carb peanut butter cups coat the sides of the paper liners, I simply melted 1 bar of 85% dark chocolate over low heat and poured it on top of the peanut butter layer. 1 bar of melted dark chocolate divided between 24 peanut butter cups is just the right amount of chocolate. It’s a thin enough layer of dark chocolate that you don’t even need to add extra sweetener to it or splurge on sugar-free “milk” chocolate chips (though you can always do that too, with Trim Healthy Mama or Lily’s chocolate chips if you like your low carb peanut butter cups to be even sweeter!). It’s not overpowering and perfectly compliments the much sweeter peanut butter layer underneath! Looking for more ways to use defatted peanut flour? Try these favorites! 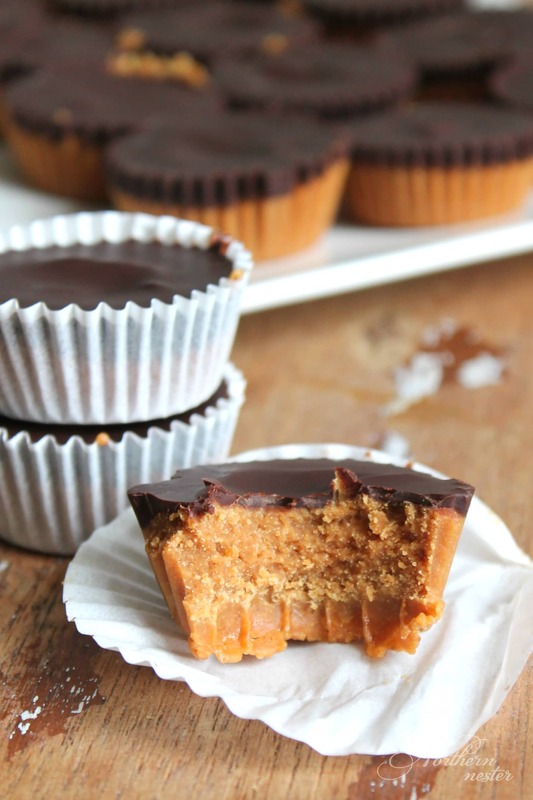 These low carb peanut butter cups are melt-in-out mouth delicious and incredibly easy to make! Bet you can't eat just one! Sugar-free, gluten-free, keto and Trim Healthy Mama S-friendly! In a large saucepan melt coconut oil, butter, and xylitol together. Remove from heat and stir in peanut flour, coconut flour, almond flour, golden flaxseed meal, and mineral salt. Mixture will thicken slightly. Spoon evenly into 24 mini cupcake liners. In a small saucepan over lowest heat, melt bar of chocolate. Divide and pour evenly over peanut butter layer. Refrigerate for an hour, or until set. Hi Jacinda, just wondering if any other sweetener besides xylitol could work in this recipe, because my husband gets horrible stomach cramps from xylitol. Do you think powdered Swerve would work, and if so how much should I use? Thanks and I’m excited to try these! ti’m not jacinda, but the chart i saw shows that xylitol and swerve are the same measurements, so you should be able to just swap one for the other. i tend to start with a bit less and taste-test to see if it’s suitable; if not, add a bit more…. I just made these and the hot chocolate doesn’t spread on the p.b. mixture. I’m thinking I was supposed to chill the mixture BEFORE spooning chocolate on? Maybe the bottom layer was actually TOO cool so that the top layer solidified/cooled too quickly and didn’t pour and spread itself? Haven’t made yet but the recipe sounds like the top layer is supposed to be liquid and pour over to spread itself, so perhaps both layers need to be still warm/hot…. just thought i throw in my 2 bits, you can take the back of a spoon to help smooth the chocolate over, and make sure your chocolate is very liquidy i ended up going back to the stove halfways to warm up my chocolate again. cant wait to try them! Why not use refined coconut oil so no ‘coconut’ flavor? Mine came out perfectly!! I only had super sweet so I used that instead of the sweetener and I had a bakers chocolate bar so I added stevia to that. Well I’m waiting for them to chill but as of right now the bites I had while making them was awesome!!! I do think next time I will add a little coconut oil in the chocolate so it will not be so hard. These are amazing!! Really hits the spot when craving candy!! I made them last evening and had one for breakfast along with hard boiled egg! Jocinda, just curious if you have ever added sweetner to the melted chocolate, if so what did you use? Thanks for all the deliciousness you post and share with us!!! Hi. Could I use the thm baking blend in these. Thanks! Instead of Almond flour, would THM baking blend be a good replacement in this recipe. Seems like everything I have made with Almond flour, I don’t like the taste. No xylitol here, out of super sweet, only have thm gentle sweet & thm pure stevia. Are these going to melt in your hands before you can pop them in your mouth due to coconut oil? Is refined ok to use? Is the nutritional information available somewhere? I looked over the entire page, but could not find a link to it. My chocolate wouldn’t melt smoothly, and cake out crumbly so I made a batch of skinny chocolate and used that. These are so yummy. I just made them for a second time. I did something wrong though and I can’t figure it out. This time they have a gritty texture, like the xylitol didn’t incorporate well. They taste just fine, but those little crunches are not great. Did I maybe add too much xylitol. Did I maybe not mix it in when the butter and coconut oil were hot enough? Can I substitute THM baking blend in the same amounts of the coconut, almond and flaxseed meal since baking blend has the same ingredients mix together?